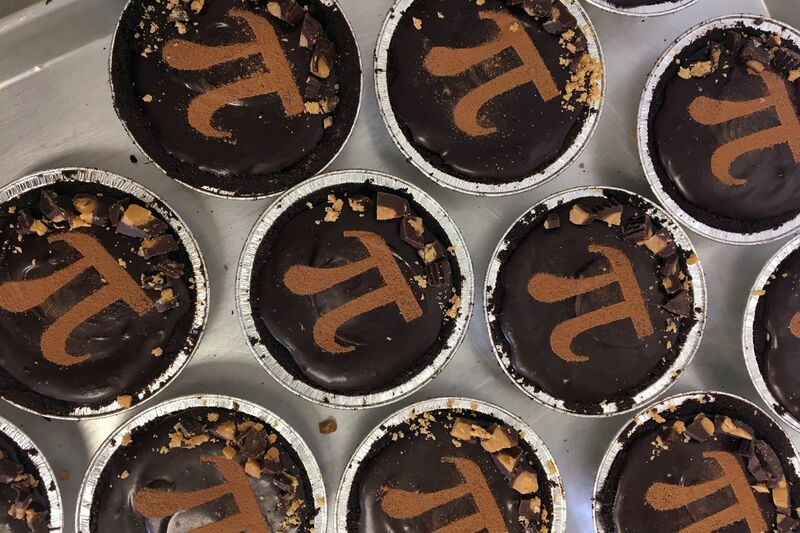 On Pi Day, Crust Vegan Bakery is offering mini and full-size peanut butter cup pies for pickup (10 a.m. to 2 p.m.) at its kitchen in Manayunk. Thursday, March 14, marks Pi Day, a math lover’s holiday honoring π, the ratio of a circle’s circumference to its diameter. Nerds all over the world will join together to celebrate, eating lots and lots of pi(e) and reciting as many digits of the mathematical constant as possible. And the Philadelphia region — brimming with schools, pizza shops, and pun aficionados — has plenty of creative ways to enjoy the day. Perhaps the most elaborate of those will take place in Princeton, where Pi Day is a beloved, decade-long tradition. Princeton businesses put on an “irrational number of events around Palmer Square,” according to the Princeton Tour Co. site, including pie-decorating challenges, Einstein lookalike contests, and a “pi-rade.” Some activities unfolded last Saturday, but plenty await this Thursday, most of which are free. One of the most eye-catching is a pop-up wedding/vow-renewal ceremony, set to begin promptly at 3:14 p.m. inside Princeton Pi pizzeria. Omiecinski, an ordained minister, says she weds and renews vows for about two dozen couples at the event each year. Afterward, newlyweds share complimentary heart-shaped pizzas. Trattoria Carina in Fitler Square will transform its standard menu of pasta and Italian dishes into that of a pop-up pizza shop. Find six Roman-style options available by the slice. This Pi Day, Fitler Square restaurant Trattoria Carina is transforming its entire restaurant into a popup pizza shop. Find six different Roman-style options available by the slice. Of course, pie — in sweet form — ranks among the most popular ways to celebrate Pi Day. Ice cream shop Weckerly’s plans to serve a chocolate sundae pie, layering chocolate and sweet cream ice cream with peanut caramel on a homemade-Oreo crust. It’s the Kensington spot’s first ice cream pie to debut to the public. “What we do in the baking side of production is very formula- and number-heavy," says Weckerly co-owner Andy Satinsky. “So this felt like a great way to celebrate that and participate in this silly way.” Stop by the Girard Avenue shop on Thursday for a $6 slice or preorder a whole pie online. Nearby, Cake Life Bake Shop is mixing ice cream and pie, too, for its apple pie milk shake. In Manayunk, Crust Vegan Bakery will sell mini and full-size peanut butter cup pies stamped with a cocoa powder π from 10 a.m. to 2 p.m. And for classic pie, head to Lil Pop Shop in West Philly or Rittenhouse; slices will cost $3.14. To earn free pie — and work off some of those calories in advance — join the folks at Philadelphia Runner for a 3.14-mile run, heading out from the shop’s Center City location at 6 p.m. A feast of sweet and savory pies will follow. This Pi Day, Weckerly's Ice Cream debuts its first ice cream pie. The Chocolate Sundae treat features chocolate and sweet cream ice cream, layered with peanut caramel, on a homemade-Oreo crust. Local schools and universities are also taking advantage of the offbeat holiday. Members of Cabrini University’s math club will have the chance to “pie” select professors as part of a fund-raising campaign. At the University of Pennsylvania, a Pi Day career panel is scheduled for students and alumni of the Graduate School of Education. “We’ll have people from all different career paths, with a good mix of both male and females so that we can break down the stereotype that only men are good at math,” says Amy Benedict, director of career and professional development at the Graduate School of Education. Many grade-school math teachers use the day as an opportunity to celebrate with special activities and lesson plans on the circumference of a circle. At Greene Street Friends School, a schoolwide celebration has become an annual tradition. In past years, students have made paper chains, gone on circle scavenger hunts, and measured the diameters of various cookies. For its Pi Day celebration, the Franklin Institute invites visitors to partake in a memorization challenge. After looking at a card listing 100-plus pi digits, participants will recite as many consecutive numbers as they can remember. Neuroscientists will be available to talk about the exercise, explaining how short-term memory works. The “ridiculously infinite number called pi” — a mathematical constant, no matter the size of the circle — is at the heart of all this pomp, according to the Franklin Institute assistant director of public programs Mickey Maley. “For a lot of people, thinking about everyday circles, whether it’s pizza or pie or bike tires and coins, is a fun way to learn about this concept."